Here is a quilting project that I finished last night. It's a backpack. The red part needed to be quilted before I could start sewing it together. I "meander" quilted it. This is the second time I have actually done my own quilting. I did enjoy it and it has inspired me to do more of my own quilting on projects. The inside of this backpack has several pockets along the bottom. 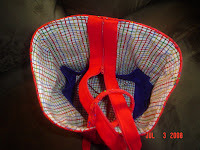 The straps include a zipper which can be unzipped to carry the backpack over both arms. Zipped, the backpack can be carried over one arm. 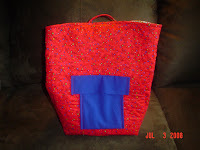 This backpack was from the Lazy Girl Designs, LLC pattern called "Chelsea Tote" by Joan Hawley. I've made the same backpack. I love it, but I'm adding a piece of velcro to hold it closed, because it tends to be too loose at the top. I'd recommend listing the pattern designer/company when you post such pictures. Thanks for your comment, especially about the pattern/designer/company.